1. Keep going to the gym. Honestly, the gym isn't even bad when I'm there but sitting at home thinking about going drains me a little bit but I hope that this month I can motivate myself to go more and actually make use of my membership. 2. Read more. I used to be such an avid reader from a young age but I completely stopped reading during my second year of A Levels and I have no idea why(Probably because I had to read the 10 books for English lit and that just drained me) but I definitely want to get back into it and read at least a couple of books this month because my to read pile is just getting bigger the more I go and pick up those 6 for a £1 books in charity shops. 3. Work on my blog photos. I've got to admit, I very rarely use the typical flatlay photos for my blog posts and usually just use a photo I've got on my phone or camera but I want to start structuring my blog photos and Instagram photos so that they are more relevant and I am more satisfied with them because right now, I just feel a bit "meh" about them. 4. Finish Gilmore Girls. Ok this isn't exactly a goal because I love the show but for some reason, I never got round to watching the last two seasons and it infuriates me whenever I think about how I still haven't finished it so I need to make sure that I actually do it this month. I've still got A Year In The Life to watch too but nobody really seemed too keen on that. I might like it though, who knows. 5. Paint more. I've recently found my love for all things art again and if you're interested in what sort of I do, please feel free to go and check out my art facebook page here but I often feel like I'm painting the same sort of stuff so I would like to expand my skills more and do different types of art. 6. Eat a bit healthier. Now I'm not saying I'm going on a diet but I do feel like I should improve my eating and stuff to feel more comfortable when I go to university so I'm going to attempt to make healthier meals but I'm not the best cook so it's going to be interesting, to say the least. 7. Stop keeping all of this stuff that I really don't need. I am the worst at convincing myself that I might actually need something at some point so I definitely can't throw it in the bin. I do want to try minimalism slowly but I'm finding it quite hard. Hopefully at the end of the month, my room will feel a lot less cluttered. 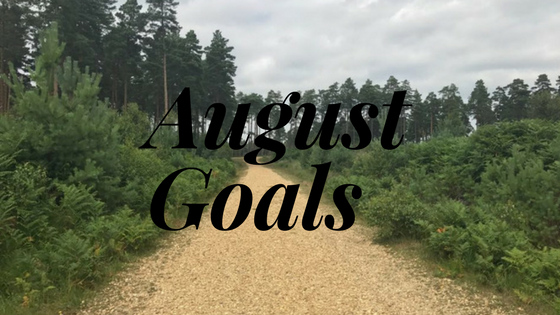 They sound like great goals - I haven't really thought about my goals for August. I'm spending it on holiday relaxing.